Maple Creek Candles are hand-poured candles made from a natural soybean wax blend. This makes them clean burning. That means low soot build up on the container and in your home. Maple Creek uses wicks that do not contain any lead or metal. Only all natural cotton wicks are used in their candles. This reduces soot and helps the candles to burn evenly. All Maple Creek Candles are richly scented. Extra fragrance is added to every hand poured batch. 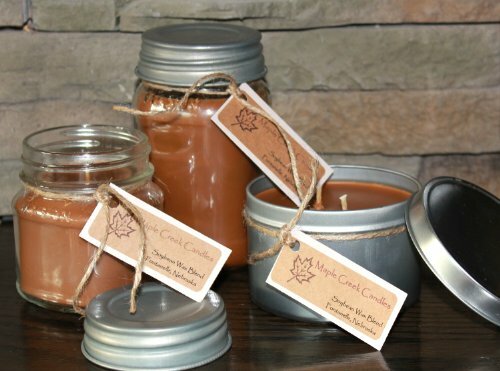 Maple Creek Candles strives to produce the highest quality candle on the market. This candle is in a 14oz MANdle tin (Candles for Men). Our Chocolate Covered Cherries candle smells like cherries covered in milk chocolate. This is a richly scented clean burning soybean wax blend candle. It is triple scented. Our candles are available in 16oz jars with rustic lid, 8oz jars with rustic lid, or our 14oz MANdle tin (Candles for Men). If you have any questions about this product by Maple Creek Company, contact us by completing and submitting the form below. If you are looking for a specif part number, please include it with your message.